Voice Translator instantly translates voice, speech, text & photo using camera for over 100 languages using AI technology. This is an indispensable translator for learning new language, travelling new country or reading documents in foreign language. + Talk in one language and the app will speak your sentence in another language. + Best used when speaking to people speaking foreign language or learning new language. 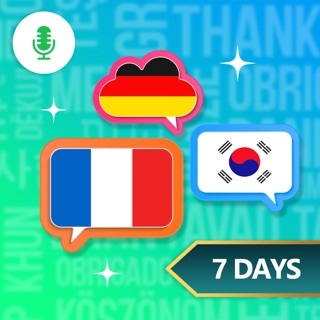 + Practice your foreign language speech until the app can hear you correctly. + Optimized for learning & travelling. + Use your iPhone or iPad camera to snap & translate texts in any language. + Translate your photos from device library. + Can scan & translate handwriting text and large documents. + Translate large text with machine learning. 200% more accurate translation result compared to old technologies. + Speak your text in any languages, also use AI technology. + All of your translated voice, photo or text are saved for usage later. + No need wifi to see your results. Turbo Translator offers subscription program for users to have unlimited access to the translation service. • Subscribed user has unlimited access to the app translate services including voice translation, photo & text translator. • User can subscribe one week (USD 2.99$) or one month (USD 9.99$) auto renewing subscription. • Unsubscribed user can only use those services with limited quota per day. - You can now translate your message instantly on Apple Watch & iMessage. Was working good. Until they changed the format. Now the share button no longer works. Sent the developers an email. They responded they would fix it. My girlfriend speaks no english and i speak very little spanish. This is a problem. I have resorted to using google translate which is rediculous because I pay for this app that no longer works. It’s hard to use because you might want to know how to say a word in Spanish so you do the Spanish thing at the top, but, then you might want to say....me too....or something so you have to switch it and then switch it and then switch it! Unlimited translation for one week. Unlimited translation for one month.